Estate planning is an often neglected part of financial planning, particularly among federal employees. “It’s for the rich” is an excuse I’ve heard people give for not taking the time to consider estate planning. Feds believe it is reserved for the well to do and a segment of financial planning that only millionaires need to worry about. They also believe it involves complicated, legal documents that require the help of a specialized estate attorney. Although this may be true if you have a large estate or a complicated family structure, most estate planning can be quite simple to prepare. At the very least, you should be educated on what estate planning is so you can make a decision on what legal documents you need. You don’t want to leave a mess behind for your heirs to deal with. Moreover, most of us want our wishes carried out in the event of our passing. A will is a document declaring your wishes for distributing your property and assets after your death. Everyone should have a will. Yes, even if you don’t consider yourself wealthy. If you own property and have multiple heirs, it definitely is a must. If you don’t have a will and pass away (this is called “intestate”), the judge will decide who gets what. In essence, they will be making a will for you. There are certain intestate rules they will follow, however. Typically, your spouse gets first claim on your assets, then descendants, then parents and siblings. Declaring your wishes in a will does not leave this up to a judge. A will can also be used to state who you want to look after and care for your children in the event of your passing. You can also name who will manage your assets for the children. This can be the same person looking after them or someone else, if you would like to draw on another family member or friend’s special skill set. One important item to note is that beneficiaries on accounts take precedence over what is spelled out in a will. Please make sure your beneficiary declarations are up to date on all your accounts. Finally, a will won’t prevent an estate to go into probate. Probate is the process by which the judge reads the will and determines who gets what. This is public information and can be lengthy and costly if the estate is large and complicated. Accounts with beneficiary information don’t go through probate. They are paid out as designated. A living trust avoids probate and is not public information. It is called “living” because you create it while you are alive. You transfer ownership of your assets to your trust. You continue to exercise control over the assets in your trust during your lifetime, but you technically are no longer the owner of these assets. The trust owns the assets. At death, these assets are transferred to the designated beneficiaries. A living trust also has the capability to shield your assets from creditors, depending on the type of trust you elect to have. In order to be effective, most of your assets should be transferred if you have created a living trust. There are potential tax benefits and consequences in creating a trust, so do your due diligence and contact a qualified estate planning attorney for guidance. A healthcare power of attorney, also known as a durable power of attorney for healthcare is a legal document providing someone the ability to make healthcare decisions for you in the case you are incapacitated. This person should share your views and know how you would want certain decisions to be made. A living will is a little bit of a misnomer, as it is not associated with a last will and testament. It is a legal document declaring how you want deathbed decisions to be handled for you. It has to do with life-prolonging measures to be taken if there is no hope for recovery. 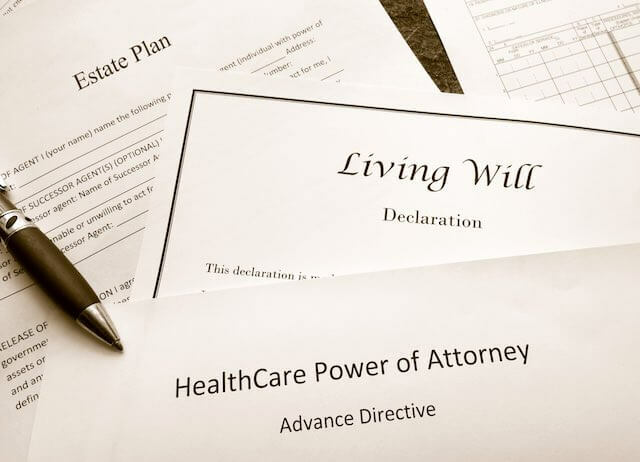 It could be possible to designate how you want deathbed issues to be handled in a healthcare power of attorney as opposed to creating a separate living will. This is a legal document declaring an individual’s right to act on your behalf during your absence or if you are incapacitated. These are used in the event you go overseas for an extended period (military), are a very busy executive or celebrity and wish for someone to handle your finances for you. They can also be used in the event you become incapacitated or are not mentally competent to make decisions. This document grants the power to enter into real estate transactions and make other financial decisions as if they were you. Estate planning documents are state specific so make sure you take that into consideration if you own property in multiple states. If your financial situation is simple, you can gather some of these legal documents through an online service. If your situation is more complex, consider utilizing the services of a qualified estate planning attorney. « Will the New Supreme Court Decision Impact Federal Employees?